This book is the result of one of the projects of the Collaborative Research Centre Coping with Social Change in Afri­can Societies at the University of Hamburg during the years 1999 to 2003. The present volume is a follow-up of the text collection Unser Leben vor und nach der Revolution [Our Lives Before and After the Revolution] that was published by us in 2004 (see link at the bottom). 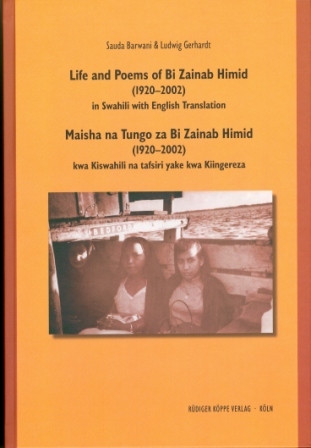 It consists of two comprehensive prefaces, one by Saad Saleh Yahya, a relative of the poet, and another one by Said A.M. Khamis, one of the most renowned contemporary researchers of Swahili literature, an autobio­graphical interview conducted by Sauda Barwani in 2001, and several poems by Bi Zainab, subdivided into love poems, political epics and religious poems. 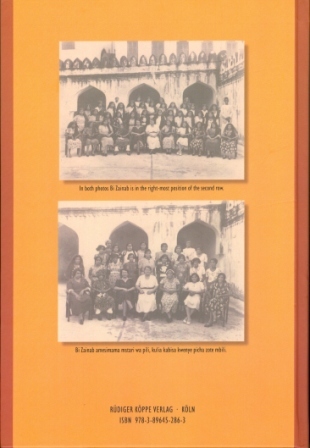 All texts are presented in Swahili and English. As I continued to read the manuscript I realized that Bi Zainab Himid’s life record as an educationalist and poet was unassailable, her personal achievements enduring and her mark on the social fabric of her generation inerasable. Her love for young people and her ability to transcend social divisions was exemplary. It dawned on me that her times were unique in east African recent history, and she was in many ways fortunate to witness the pleasures and the hardships of growing up in the inter-war period when Zanzibar’s influence in the world was but a mere shadow of its former self and Britain was flexing its muscles, probably for the last time before the rapid post-war decline; and when Swahili nations from Moroni to Benadir were being assailed from all directions. It needed a strong girl to survive such difficulties and emerge unscathed. When we mention the name of Bi Zainab Himid Mohammed and follow it up with the titles of Swahili poetry, and then we propose to look at her poems, many of the experts of Swahili literature will find themselves in two situations: First they know that there are only few female writers on the side of prose and poetry, second they will discover with great pleasure that there are different Swahili poems written by women which are still hidden although from time to time they begin to be discovered. One of these works is the poems of Bi Zainab Himid Mohammed. […] Many works of art which were written by Zanzibari, be they women or men, were read only once and afterwards they were thrown away or kept carelessly in inappropriate places. Perhaps some of these works were eaten by termites or they decayed, or were torn or even crumbled because of the heat and high humidity in the air on the islands of Zanzibar. Luckily some of the poems of this lady were found and published in this collection. This encourages us more that there are works of deceased writers and those who are still alive that are waiting to be dis­covered accidentally like the poems of Bi Zainab have been discovered. The truth is that the idea of preserving our lit­erature and cultural heritage is not in our heads, and so they wait for enthusiasts from other cultures who value them – if it is true that they value them to such an extent.